Defender Michael Keane is understood to have knocked back Burnley’s latest contract offer amid interest from Premier League champions Leicester City. The 23-year-old, who was the subject of a bid believed to be in the region of £11.5m from the Foxes last month, was offered a new four-deal at Turf Moor last week as the Clarets’ board began the battle to keep him on their books. However, the former England Under 21 international, signed from Manchester United on a permanent deal last January, has reportedly turned down the chance to become the best-paid player in the club’s history. Keane, inducted in to the PFA Championship Team of the Year after helping Sean Dyche’s side make an immediate return to the top flight last term, still has two years remaining on his current deal but he appears reluctant to add to that with the opportunity of Champions League football in the offing. 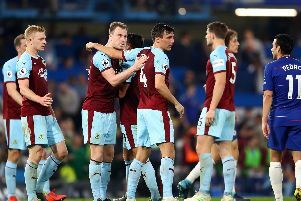 The Clarets aren’t under any pressure to sell at this stage, with Keane reporting back for pre-season training at the Barnfield Training Ground on Monday as expected, but the latest rejection may see King Power Stadium boss Claudio Ranieri return with an improved offer in the near future. The Italian coach, nicknamed the ‘Tinkerman’, has already signed 27-year-old Spanish centre-back Luis Hernandez from Sporting Gijon to provide competition for defensive duo Robert Huth and Wes Morgan, though the signing of Keane is believed to be one of his main objectives this summer. The one-time Old Trafford trainee, who scored five goals and contributed to 20 clean sheets in 46 appearances as the Clarets were crowned champions last season, played 22 games on loan with the Foxes in 2012-13 with Nigel Pearson at the helm. After sealing the title, the defensive kingpin, linked with various Premier League suitors then, said: “It’s not distracting (the speculation). Obviously I see it but I don’t know whether to believe it or not. It’s just one of those things. “It can be very flattering but I’m really happy here at Burnley. Everyone in the team, the manager and the fans have been great with me so there’s no reason for me to leave. “You just have to take it as a compliment. It just proves that you’re playing well if there are teams coming after you. “I think I’m doing well consistently now. I think I’ve been doing well on a personal level for a while now, so I’m just hoping to keep it up. “I think I’ve developed a lot here under the gaffer. I’ve had all the experienced players helping me as well.